B.Side:- “The King Has Lost His Crown”. Epic S EPC 7914 Stereo 1976. Graded:- Sleeve/Record. EPIC 'A' label PROMO ISSUE 1978. the record will show significant signs of having been 'well played', it will show surface scratches and/or scuffs but will still play nicely without too much background noise. ARTIST: ABBA. ORIGINAL 1981 UK EPIC PICTURE DISC 7" SINGLE IN VERY GOOD CONDITION AND ALSO CD SINGLE THAT WAS PART OF THE LIMITED EDITION BOX SET 'THE COMPLETE ABBA CD SINGLES COLLECTION'. VINYL CATALOGUE: EPIC EPCA 11-1740. ABBA - Waterloo. Record Label : Epic Records. 1974 UK 7" vinyl single. This is one of 10000 singles LP's, 12” and 7" that I HAVE COLLECTED OVER THE LAST 30 YEARS; they run from the 1950's to the 2000's and cover every style of music. 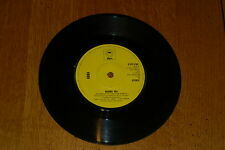 ABBA - Does Your Mother Know - 1979 UK 2-track 7" Viny Single..
ABBA - Does Your Mother Know. 1979 UK 7" vinyl single with intact four prong centre. Also includes : Kisses Of Fire. This is one of 10000 singles LP's, 12” and 7" that I HAVE COLLECTED OVER THE LAST 30 YEARS; they run from the 1950's to the 2000's and cover every style of music. ABBA - SOS. 7" SINGLE 1975, EPIC EPC 3576. VERY GOOD CONDITION. A: Mamma Mia. Artist: ABBA. Catalogue Number: SEPC3790. the sound, which is why we play testall of our records. So you know the sound quality of the record you're getting, not just what it looks like. Epic S EPC 4499 Stereo 1976. Graded:- Sleeve/Record. Artist: ABBA, Bjorn, Benny, Anna & Frida. A: Waterloo. Catalogue Number: SEPC2240. the sound, which is why we play testall of our records. So you know the sound quality of the record you're getting, not just what it looks like. ABBA - DOES YOUR MOTHER KNOW. 7" SINGLE 1979, EPIC EPC 7316. VERY GOOD CONDITION. ABBA - Voulez Vous (Extended Dance remix) 6:07 c/w If It Wasn't For The Night. ABBA - WATERLOO. 7" SINGLE 1974, EPIC S EPC 2240. VERY GOOD CONDITION. 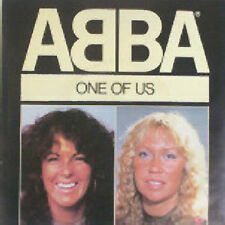 ABBA - One Of Us. Record Label : Epic Records. 1981 injection moulded 7" vinyl single. This is one of 10000 singles LP's, 12” and 7" that I HAVE COLLECTED OVER THE LAST 30 YEARS; they run from the 1950's to the 2000's and cover every style of music. ABBA - CHIQUITITA. 7" SINGLE 1978, EPIC EPC 7030. VERY GOOD CONDITION. ABBA - Chiquitita. Record Label : Epic Records. Country of Origin : UK. This is one of 10000 singles LP's, 12” and 7" that I HAVE COLLECTED OVER THE LAST 30 YEARS; they run from the 1950's to the 2000's and cover every style of music. ABBA-WATERLOO.7" 30TH ANNIVERSARY EDITION. NEW BUT NOT SEALED. EPIC Records SEPC 2452 UK 1974. 7" 2nd pressing with solid centre. Rock 'n' Roll Band. Records are play tested both sides for condition, not just visually graded. 7"SINGLE 1979, EPIC EPC 7914. VERY GOOD CONDITION. B side - Watch out - S EPC 2240. ABBA Chiquitita - 1978 UK 7" vinyl single, also including Lovelight, SEPC7030. In excellent condition. ABBA "SOS c/w MAN IN THE MIDDLE" CLASSIC 70's LISTEN! SOS c/w MAN IN THE MIDDLE. CONDITION EX . BOTH RECORDED LIVE AT WEMBLEY. SLEEVE RATES EX. CONDITION MINT-. Record Label : Epic Records. Country of Origin : UK. This is one of 10000 singles LP's, 12” and 7" that I HAVE COLLECTED OVER THE LAST 30 YEARS; they run from the 1950's to the 2000's and cover every style of music. ABBA - Fernando. 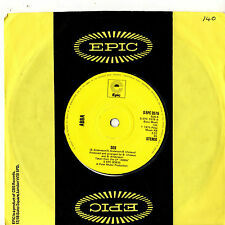 UK Yellow label Epic 7" vinyl single. Record Label : Epic Records. This is one of 10000 singles LP's, 12” and 7" that I HAVE COLLECTED OVER THE LAST 30 YEARS; they run from the 1950's to the 2000's and cover every style of music. ABBA - Under Attack. Record Label : Epic Records. 1982 UK injection moulded 7" vinyl single. This is one of 10000 singles LP's, 12” and 7" that I HAVE COLLECTED OVER THE LAST 30 YEARS; they run from the 1950's to the 2000's and cover every style of music. ABBA Waterloo - 1974 UK 7" vinyl single, also including Watch Out, SEPC2240. Record Condition : Excellent. REST OF THE WORLD £5.80. ABBA - Super Trouper. Super Trouper 2. Record Label : Epic Records. Country of Origin : UK. This is 7" picture disc by Abba. vinyl & stickered sleeve are in new & unused condition. ABBA * WATERLOO * 40TH ANNIVERSARY LIMITED NUMBERED 7" PICTURE DISC * BN&M! Waterloo (Swedish Version). Waterloo (English Version). Picture disc is housed in a clear vinyl sleeve with individually numbered title sticker (#628). Item is in new /unplayed condition. MATRIX NOs. EPC-S 6595 A2, EPC-S 6595 B2. 7"SLEEVE A LITTLE WORN, RECORD HAS A COUPLE OF MARKS IN CENTRE AND MINOR SPINDLES BUT PLAYS EX BOTH SIDES. B.side; I'm A Marionette. On the 1977 Epic record label EPC 5950 and is in Excellent - condition. Has a slight tear on the sleeve. Weight 38g. ABBA - Slipping Through My Fingers -. Rare Exclusive Japanese 'Coca-Cola' promotional only Picture Disc LP. Housed in unique picture sleeve, with gatefold insert. Agnetha Faltskog/ABBA -The Heat Is On c/w Man. All Vinyl Graded visually. Artist: ABBA & Björn & Benny, Agnetha & Anni-Frid. A: Waterloo. Catalogue Number: OS-13177. the sound, which is why we play testall of our records. So you know the sound quality of the record you're getting, not just what it looks like. LABEL:EPIC S EPC 4036. " FERNANDO ". Records advertised as Sealed or Unplayed should be Mint. POOR: The record will not play properly due to scratches, bad surface noise, etc. BAD: The record is unplayable or might even be broken, and is only of use as a collection-filler. 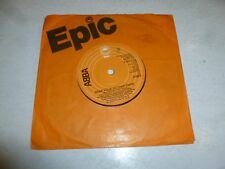 ORIGINAL 1978 UK EPIC LABEL 7" SINGLE AND ALSO CD SINGLE THAT WAS PART OF THE LIMITED EDITION BOX SET 'THE COMPLETE ABBA CD SINGLES COLLECTION'. VINYL CATALOGUE: EPIC EPC 6595. VINYL HAS A LOVELY CLEAN SHINE AND LOOKS TO BE RARELY PLAYED, PLAYS THROUGH PERFECTLY AND SOUNDS GREAT. REST OF THE WORLD £5.75. RECORD IS IN EXCELLENT CONDITION WITH NO SCRATCHES TO THE VINYL. ABBA - I Have A Dream. Record Label : Epic Records. 1983 UK 7" vinyl single. This is one of 10000 singles LP's, 12” and 7" that I HAVE COLLECTED OVER THE LAST 30 YEARS; they run from the 1950's to the 2000's and cover every style of music. ABBA - Does Your Mother Know. Record Label : Epic Records. 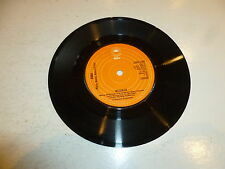 1979 UK 7" vinyl single with intact four prong centre. Also includes : Kisses Of Fire. This is one of 10000 singles LP's, 12” and 7" that I HAVE COLLECTED OVER THE LAST 30 YEARS; they run from the 1950's to the 2000's and cover every style of music. 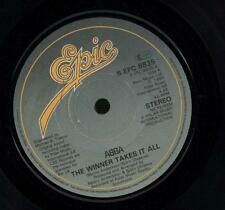 ABBA - Angeleyes - 1979 UK orange Epic 7"